At the AMC Boston Common 19, VIP customers get access to a separate, ostensibly shorter, line for concessions. Say a prayer for one of the last equalizers left in America: the old-fashioned, first-come, first-served queue. Someday we’ll tell our grandkids about it. In my day, everyone waited in the same line, and we liked it. But now? Wherever you look there are two lines. A priority line for insiders. Another line for everyone else. What started at airports and spread to amusement parks, highways, and the Hy-Line ferry to Nantucket has reached the pinnacle of absurdity. At the South Shore Plaza this past Christmas, Santa’s lap had a FastPass. This spring, Fenway Park will debut TSA Precheck-style expedited entry, but more on that soon. First let’s visit the concession stand at the AMC Boston Common 19, where a subtle drama was unfolding on a recent weeknight. You can almost hear the trailer. In a land of growing inequality, at a time when even popcorn can trigger class resentment . . .
With a special screening of Dwayne (The Rock) Johnson’s “Fighting With My Family” and a bunch of popular movies about to start, the concession line was 10 deep. Well, the “nonmembers” line was 10 deep. 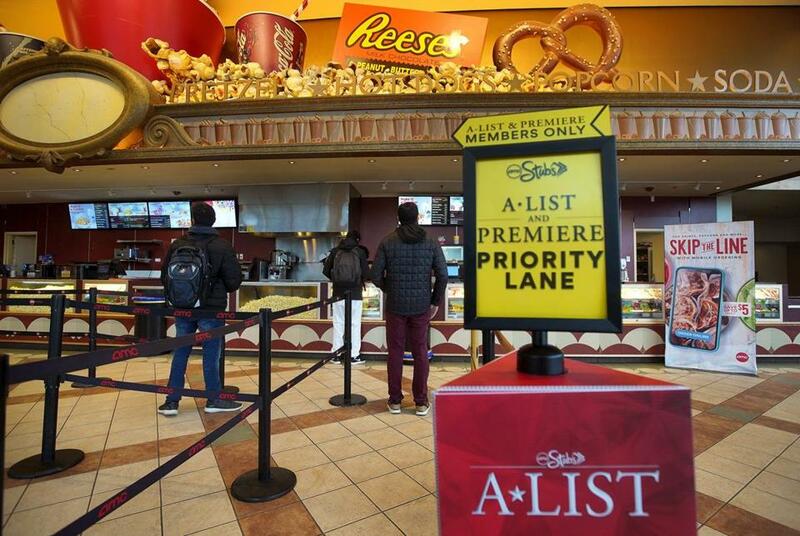 The second line, for “A-List & Premiere Members Only” — who pay as much as $23.95 monthly for perks that include priority access to the concession counter — contained exactly no one. A growing number of restaurant and coffee shop customers are ordering ahead, and not everyone is happy. But then in strode Erik Wallin, local attorney and AMC VIP. The counter worker snapped to attention. “Premiere member!” he cried out. Wallin approached the glass case. “Can I get mozzarella sticks?” he said. The commoners from the slow lane took note. “It’s bizarre,” said Randy Boudreau, a French teacher from Boston, glancing at the “members only” sign. But was it superiority — or jealousy — speaking? Because if there’s anything worse than waiting in line, it’s watching others get frontsies. One way or another, we’d better get used to it. Increasingly, people who are willing to turn over biometric information — such as fingerprints or iris scans — are getting airport-style priority access at non-airport venues like stadiums and arenas nationwide. This spring for example, Red Sox fans who are members of TSA’s Precheck program (which costs $85 for a five-year membership) will be allowed to enter Fenway Park through a dedicated and faster gate: Gate E.
They’ll show their “known traveler number” on a mobile device or printout, along with the game ticket, and zip right in. For this venture, the Red Sox are partnering with Idemia, a France-based identity and security company that runs the Transportation Security Administration’s expedited enrollment check-in technology. For now, the Precheck credentials provide only faster entry into the park. But Idemia is planning to create a “Trusted Fan Program” at Fenway and other partner venues. It will integrate biometric and credit card and other pertinent information and create a system that enables a fan to buy a hot dog or a cap with a simple hand wave in front of Idemia’s — yes, this is a real thing — MorphoWave machine. The information is not shared with TSA, an Idemia spokeswoman said, but it is shared with the partner venue, which, having learned which beer you like, for example, could send push notifications alerting you that the concession stand at Section 10 is packed but there’s no line at Section 8. In an impatient nation, where real status and privilege — and access to the pricey luxury box — are hard to come by, the fast lane is an increasingly popular perk, said Ryan Buell, a professor of service management at Harvard Business School. And those in the slower line, he said, are made even less happy knowing that others have a comparative advantage. He recently did a study that found people would rather wait in a slower-moving line — up to 70 seconds slower — than suffer the fate of being the last person in line. It doesn’t take much to set off resentment, and if there’s one thing sure to do it, it’s seeing another baby get priority over yours. That dynamic was at least briefly in play over Christmas at the South Shore Plaza, when some parents saw VIP babies being quickly ushered to Santa and didn’t know that those families had simply made reservations online (and had preselected and paid for their photo packages). It’s an opportunity available to everyone for a $2.95 fee. Why are we desperate to buy ourselves out of waiting? Ken Cornick, the president of Clear, a firm that partners with sports venues and airports to enable speedier access, says the iPhone and Uber have raised the bar. But even as one source of friction is being erased, another is building: between those without priority access and those with it. Back in the “nonmembers” line at the movie theater, a retiree from the Cape, in town to see a “Green Book” matinee, was bitter about the priority line, even though, as it happened, there was no wait to speak of in the popcorn line for regular folk. “If people are willing to pay for it. . . .” she said, sounding disgusted and glaring at the VIP line, which had no one in it.